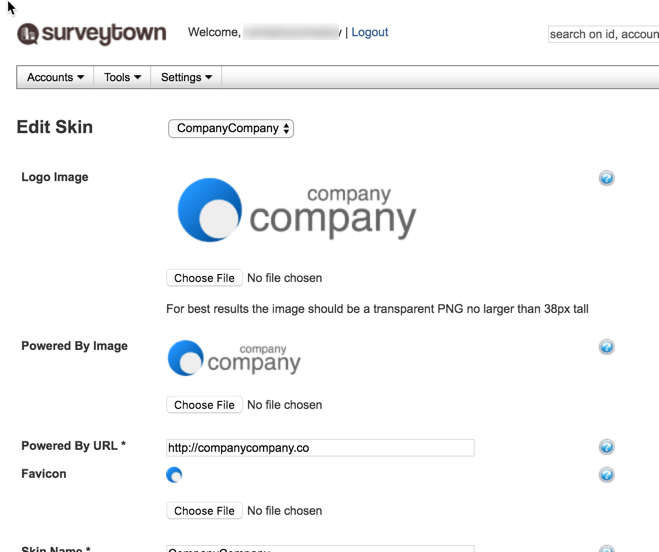 If you are a white-label partner, you can change the application skin to show your logo and colors. The skin is accessible via our super admin. Here's how to edit your skin. 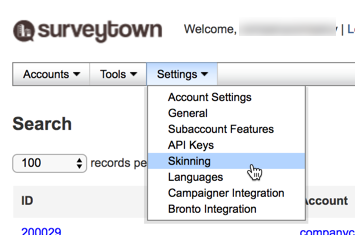 Go to "Settings > Skinning"
Powered by Text - In some places, we may use this text to brand the application to your name. Support Email - This is the email where you customer can reach you for support. It is shown in some strategic places so customer can reach you if they have concerns or questions. Login Domains - This is where you can customized the login URL for domain. This can be a subdomain of myfeedback.io or givemyresponse.com or it can be your own fully qualified domain if you have set that up with us previously. Please send an email to [email protected] to set this up. CSS - You can add custom CSS to override our defaults to modify things such as button colors.